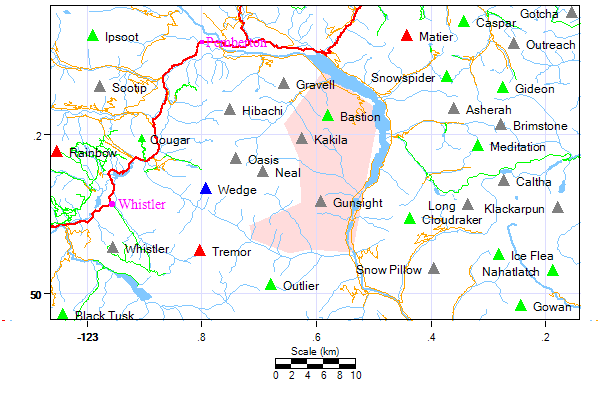 Area: 226 sq km.Location: The Bastion Range is a small group of mountains located on the western shore of Lillooet Lake. The northeast corner of Garibaldi Park cuts into the northwestern part of the Bastion Range. Terrain: The Bastion Range consists of two parallel ridge systems that run roughly north-south, with a trench and a pass separating the two ridges. The higher eastern ridge system contains all three named peaks in the range: Moat Peak, Rampart Mountain, and Bastion Peak. Halberds Edge Ridge is the bumpy and occasionally jagged and knify part of Bastion Peak’s south ridge. The rock is generally quite loose. There are a few small lakes but no glaciers in this range. History: Information about the Bastion Range had been difficult to obtain until August 2008 when Greg Jones and Fred Touche spent two days exploring the eastern ridge system in this range. It appeared that the southern portion of the range had been previously accessed by heliskiers or surveyors. Cairns had been built on the summits of Moat Peak and Rampart Mountain. Bastion Peak and its northeast subpeak, Bastion NE1, in the northern part of the range appeared to have been unclimbed until this trip.